Bermuda’s Flora Duffy’s road to the Tokyo 2020 Olympic Games officially kicks off this weekend as the 2018 World Triathlon Series Yokohama event begins the two-year Olympic qualification period for Triathlon. In the third stop of the Series, elites will battle it out in the second Olympic-distance course of the season with both 2017 WTS Yokohama race winners Duffy and Mario Mola returning to reclaim their crown. Yokohama will also host the first stop of the 2018 World Paratriathlon Series with all races beginning Saturday, May 12th. In the third stop of the 2017 World Triathlon Series the elites triathletes head to Japan to return to the familiar event of the 2018 ITU World Triathlon Yokohama, which this year will also mark the start of the road to Tokyo 2020 Olympics. With the Elite Women racing over an Olympic distance, and only two weeks after Duffy‘s “coronation” on her own country, 52 Women will try to get the first ranking points on the long and exciting road to Tokyo 2020. Topping the women’s start list will be indeed the Bermudian Duffy, who has had a month of April that will be hard to forget. 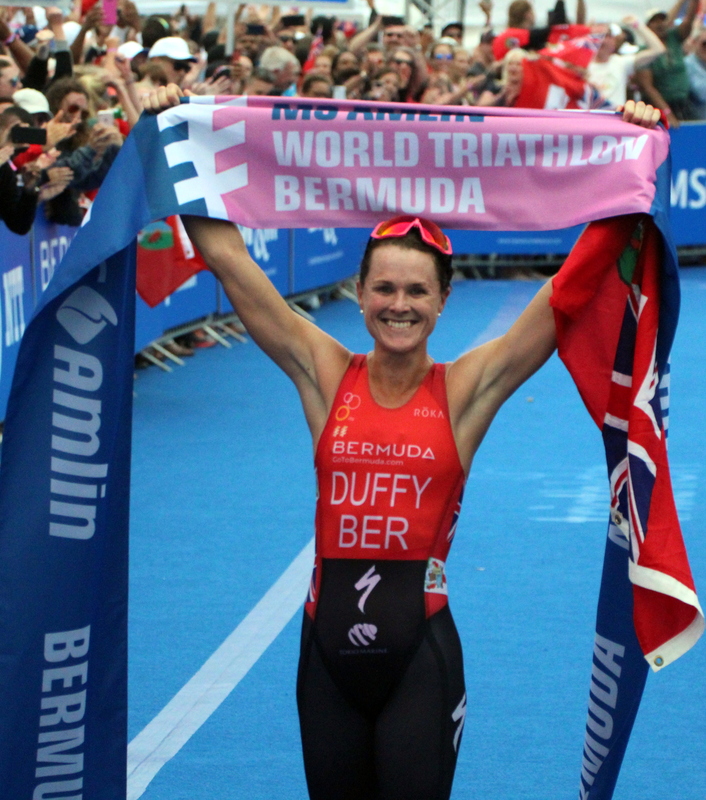 Duffy claimed Gold Medal in the Commonwealth Games in the Gold Coast, Australia, with a solid performance, to then shine as only she can do and executed a perfect race to claim the first-ever WTS Bermuda 15 days ago, with thousands of spectators cheering her name. With that in mind, the double World Champion will have to remember that the course in Yokohama is not as hard as the streets of Bermuda, but is quite technical and slippery when wet, so she will have to demonstrate her magnificent bike skills to try to be, once more, on the podium in Yokohama. But possibly Duffy’s biggest threat to her crown this year is going to come from the local Triathletes. With Juka Sato, Juko Takahashi, Juri Ide and Ai Ueda toeing the start line in their home nation, the Japanese will be one strong squad to beat, and have shown in the last couple of races that their bike skills and running style have improved consistently. Another strong squad aiming for glory in Yokohama will be the Americans, with again a really strong team headed by the current Series leader, Kirsten Kasper, and the Bronze Medalist in WTS Bermuda, Katie Zaferes. Both of them strong bikers and phenomenal runners, they are among the few athletes capable to keep up with the frantic rhythm that Duffy will most likely impose since the first strokes of the swim. Also a great swimmer, Summer Cook can be included in this pack.